FBI Director Doubles Down On Linking Scrutiny Of Police With Rise In Violent Crime : The Two-Way James Comey said police restraint, born from increased scrutiny in the wake of high-profile police killings, may be contributing to an uptick in violent crimes in some cities. FBI Director James Comey says police restraint, born from increased scrutiny in the wake of high-profile police killings and evidence of racial bias, may be contributing to an uptick in violent crimes in some cities. 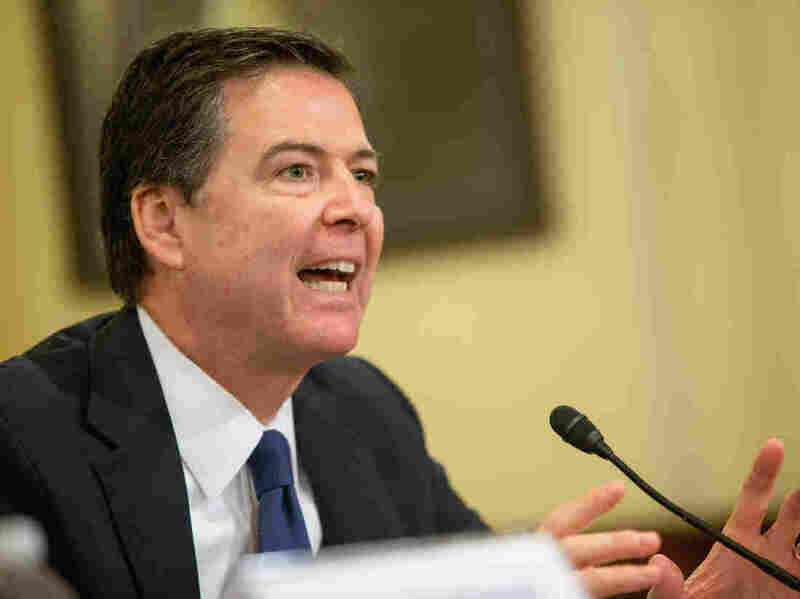 On Monday, FBI director James Comey reiterated that the rise of violent crime in certain cities may be a result of less aggressive policing due to increased scrutiny of officers in the wake of recent high-profile police killings of black men. Repeating remarks he made last week, Comey said at the annual convention of the International Association of Chiefs of Police in Chicago that police and communities of color are "arcing apart" with every incident that involves police misconduct or an attack on law enforcement. He said this growing separation can be seen in many different ways, one of which is through the lens of social media. "I actually see an example and demonstration of that arcing through hashtags: the hashtag Black Lives Matter and the hashtag Police Lives Matter," he said. "Of course, each of those hashtags and what they represent adds a voice to an important conversation, but each time someone interprets hashtag Black Lives Matter as anti-law enforcement, one line moves away and each time someone interprets hashtag Police Lives Matter as anti-black, the other line moves away." "And just as those lines are arcing away, and maybe, just maybe, because those lines are arcing away from each other, we have a crisis of violent crime in some of our major cities in this country, and in those cities in some of our most vulnerable neighborhoods." The speech echoed remarks he made during a speech at the University of Chicago Law School on Friday. There, he questioned whether people with cell phone cameras were causing police to avoid daily interactions. "In today's YouTube world, are officers reluctant to get out of their cars and do the work that controls violent crime? Are officers answering 911 calls but avoiding the informal contact that keeps bad guys from standing around, especially with guns?" Comey answered his own question, saying he "didn't know" whether police hesitance explains the uptick in violent crime in some cities, but said that he has "a strong sense that some part of the explanation is a chill wind blowing through American law enforcement over the last year." Comey isn't the first person to mention this idea, sometimes called the "Ferguson effect," as NPR's Martin Kaste reported for Morning Edition. "This idea — that the cops are holding back — has been floating around law enforcement circles since Ferguson. Earlier this month, the mayor of Chicago, Rahm Emanuel, said he worries about officers becoming reluctant to take action. "This subject is especially urgent in Chicago because gun violence has jumped here, lately. September was the city's deadliest month since 2002. At the same time, Chicago police are under pressure to dial back how often they stop and frisk people — the ACLU threatened a lawsuit over racial disparities, and the department agreed to keep closer track on who's being stopped, and why. Some officers say that kind of scrutiny makes them less likely to follow their instincts." But some people on Chicago's South Side, however, say they haven't noticed a lag in police activity. In fact, Mekazin Alexander told Martin that racial profiling remains problematic. "More people who have dreadlocks are targeted and pulled over," she said. "So if your hair is a certain way and you're black, you're a black male, you're pulled over, you're targeted." Duer Jones, who also lives in Chicago, says the same thing. "Just at random, if there's three or more of us walking, we're going to get stopped and frisked for no reason." Comey's hypothesis about linking police scrutiny and conseqent wariness to hikes in violent crime is a controversial idea. The New York Times reported that Comey's Friday speech ruffled feathers within the Justice Department. "Mr. Comey's remarks caught officials by surprise at the Justice Department, where his views are not shared at the top levels. Holding the police accountable for civil rights violations has been a top priority at the department in recent years, and some senior officials do not believe that scrutiny of police officers has led to an increase in crime. While the department had no immediate comment on Friday, several officials privately fumed at Mr. Comey's suggestion." Similarly, White House Press Secretary Josh Earnest steered well clear of Comey's hypothesis at Monday's daily press briefing, saying, "The evidence we've seen so far doesn't support the contention that law enforcement officials are somehow shirking their responsibility, and in fact you've seen law enforcement leaders across the country indicating that's not what's taking place."